“Where should we grab dinner?” It’s a question that can either make or break friendships. Sometimes you need two weeks in advance to plan dinner with your mates because some want the cheap deals, while others enjoy the cocktail splurge with a side of stale chips. However, things get really complicated for foodies when we have to gather meat eaters and vegetarian friends around the same table. Lucky for us Gold Coasters, we live in a place where vegetarians can eat out without surrendering to depressing green salads or cardboard-flavoured burgers. Yep, your life is safe until your next brunch; ‘cause we’ve rounded up our favourite places where vegetarians and meat-eaters can eat together without forking one another. Errybody knows the best prevention for a hangover is not to drink on an empty stomach. 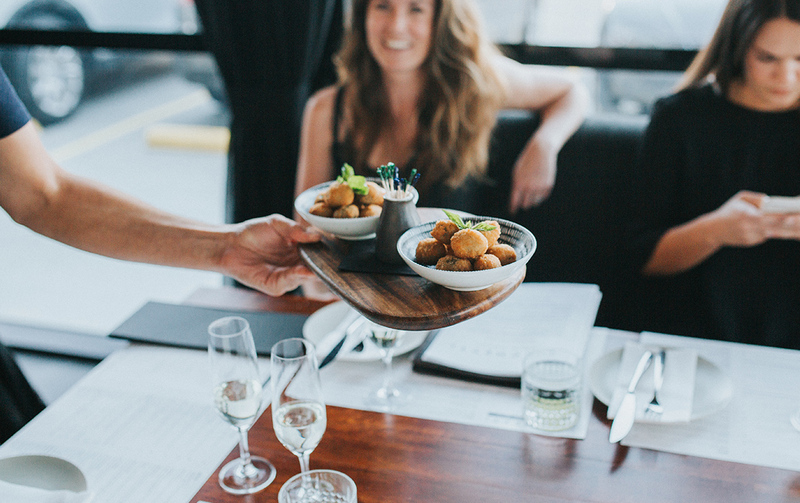 Nobbys’ favourite bar has you covered, with a talented head chef that specialises in vegan eats! At The Cambus Wallace on Thursdays, you can score three vegan courses for just $25; included delicacies are pumpkin, chickpea and brown rice balls with labneh and a side of roasted baby carrots, finished with deconstructed apple pie and coconut ice cream. While for you, meat lovers, why not try the Spanish chorizo and Aussie prawn platter–perfect for a happy hour followed by three too many cocktails. 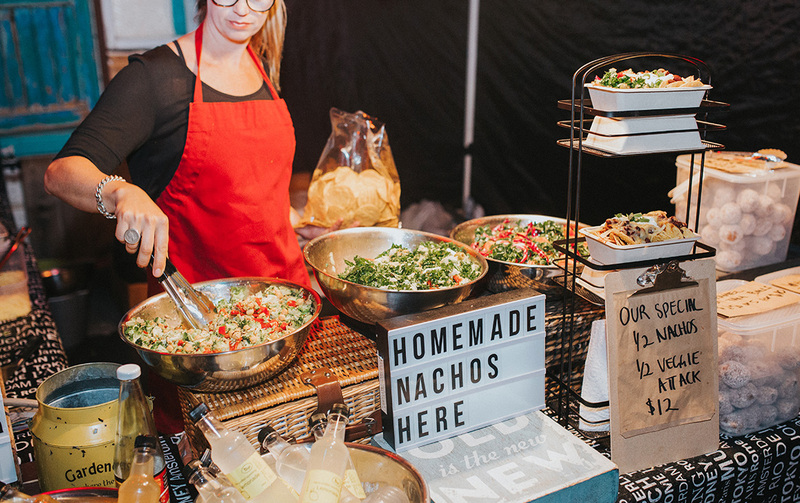 Combine street food stalls in an industrial Brooklyn-style area with live music sessions, and you get Miami Marketta, Gold Coast’s favourite destination when one can’t be bothered to glam up for dinner, or tackle a serious night of drinking. Open Wednesday, Friday, and Saturday nights, you can choose from vegan tacos at The Hungry Belly, to Spanish-style paella by Pablo Pablo, delicious Greek-style falafels by Seko Foods, to Hungarian street food, we never leave disappointed. Regardless of one’s penchant for meat or otherwise, everyone loves Mexican food. Bonita Bonita knows this and has a wicked line up of vegetarian options like Calabaza tacos with pumpkin, corn mole, and chimmichurri or Queso tostadas with tempura provolone, pickled cabbage, and habanero jam. Your vego friends will never feel alienated at your next group date either, with the top-value banquet spread that’s totally accommodating for non-meat eaters. Nothing brings people together like a hearty plate of pasta or steaming pizza. Isle of Capri’s Italian restaurant Cicchetti knows this, and always brings vegetarians to the table as well. The Neapolitan-style gnocchi alla sorrentina (deep-fried potato gnocchi with homemade tomato sauce) or an Italian classic spaghetti cacio e pepe (spaghetti with aged cheese and pepper) will surely win your plant-based friends over. And If veggies don’t fill you up, we recommend the caserecce al salmone (house-made pasta with smoked salmon, zucchini, vodka, mascarpone cheese, and sesame seeds), or a good ol’ plate of spaghetti bolognese. Mamma mia! Broadbeach’s new gem, Hideaway is the place to go for modern Asian street food. We recommend heading straight for the fresh raw fish entrée with oysters and salmon tartare; while your vego friends can dig into the crunchy spring rolls with sweet chilli tofu, or tofu in spicy fashi broth. Hungry? Tempura whole fish it is, while the yellow vegetarian curry with eggplant, tofu, and beans is a sweet choice for your plant-lovin’ friends. One dish that’s certain to satisfy all, make peace over a serving of deep-fried green tea ice cream; it’ll solve any lingering food envy! Dietary clashes always rejoice in front of an acai bowl or a jaffle. It’s a fact. Fortunately, Palm Beach’s brunch hotspot has both; delivering hangover-proof brekky plates that satisfy all sorts of bellies. From its spiced lentil, roast pumpkin and feta vegetarian jaffle, AKA the Voodoo Dahl; to a smoked organic leg ham with Swiss cheese and mustard version for meat-eaters. Or perhaps Spikexx’s tasty selection of eggs on toast like The Bun, eggs with organic bacon, dressed in garlic aioli on a brioche bun–you will certainly need an espresso to digest it all. There’s no need to fly to Italy to relive your Eat, Pray, Love moment of love-making with a plate of pasta. Go to Nobbys’ chic Italian restaurant Gemellini and dig into a plate of spaghetti all’amatriciana (guanciale, chilli, tomato sauce); or some tagliatelle ai funghi (house-made pasta with field and porcini mushroom, drizzled with truffle oil), if you feel like sharing. And while your vegetarian friends scoff those funghi arancini with buffalo mozzarella and bianco truffle oil, you can (politely) polish off a platter of Italian imported cured meats and cheese with homemade bread. Sure, it’s vegos’ territory, but there’s no need to feel threatened. The Pod has conquered the hearts and bellies of many meat-eaters who have fallen in love with its colourful and Insta-worthy healthy dishes. Our favourites to share are the pumpkin-spiced pancakes with peanut butter ice cream and the filling peanut butter and jelly smoothie bowl topped with fresh fruit. Savoury tooth? Get amongst a generous portion of vegan fusion tacos, or a protein burger with homemade BBQ sauce, vegan cheese, and cassava chips. You and your foodie mates will literally be like peas in a pod. 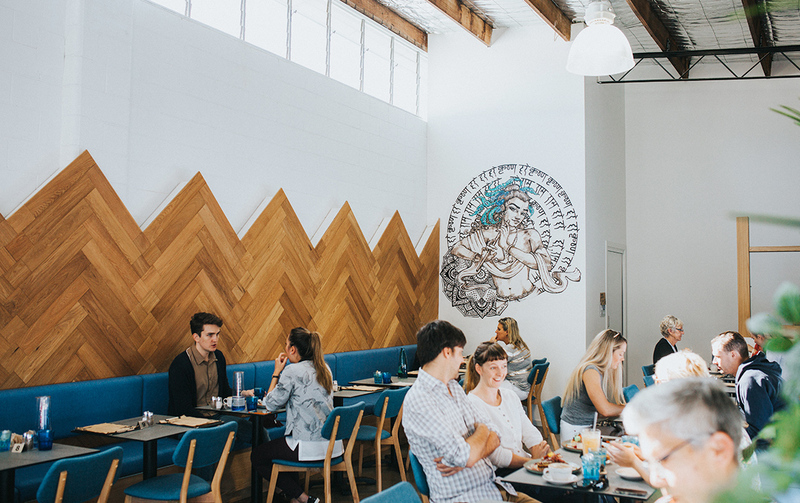 The Yard Cafe in Nobby Beach is perfect for a business meeting, or a Sunday session with friends. Their Baghdad Eggs with potato flat bread and hummus are vegetarian approved. Meat lovers, you must try their “monster” wagyu beef burger with cheese, bacon, and pickles. Though be warned, you’ll be rolling all the way to the beach afterwards! Summer days are near and so are post-swim cravings. Just a stroll from the beach, Mermaid’s Alfred’s Diner takes care of those craving with chocolate acai bowls, classic hot dogs with mustard and fried onions, offered with a vegan “sausage” if needed, and one of the best coffees you’ll find in Mermaid Beach. This Mermaid Beach patisserie and breakfast destination does carb days like no other. Share a traditional house-made French croissant dipped in vanilla bean egg custard with your vego friend, or add bacon if you’re feeling naughty. Your meat-free friends can dig into Bam Bam’s mushrooms on toast with ricotta, confit garlic, and Paddock Bakery’s toasted pumpkin sourdough. Or if you’re really feeling the meat cravings, don’t skip the Wagyu beef pattie with melted cheese on wood-fired Paddock roll, otherwise known as the Bam Bam Biggie. Yum!